Dave Hall, a 2005 member of Phantom Regiment, sent this shot. 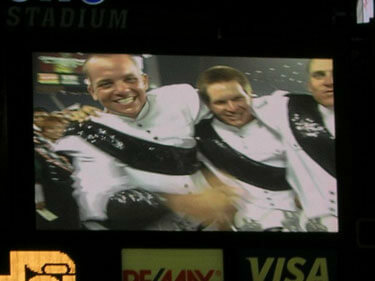 This is a picture of three Phantom Regiment snare drummers on the video screen during the 2005 ageout ceremony at the World Championships in Foxboro, Mass. (Props to my mom for her quick reflexes in snapping this shot!) From left: Dave Hall, Nick Miller and Darrin Hicks. Darrin and I have been good friends since 2003 when we were members of Crossmen, and Nick and I became very close as well. It was a great year to go out on with Regiment, and I couldn't have asked for a better group of guys to age out with!